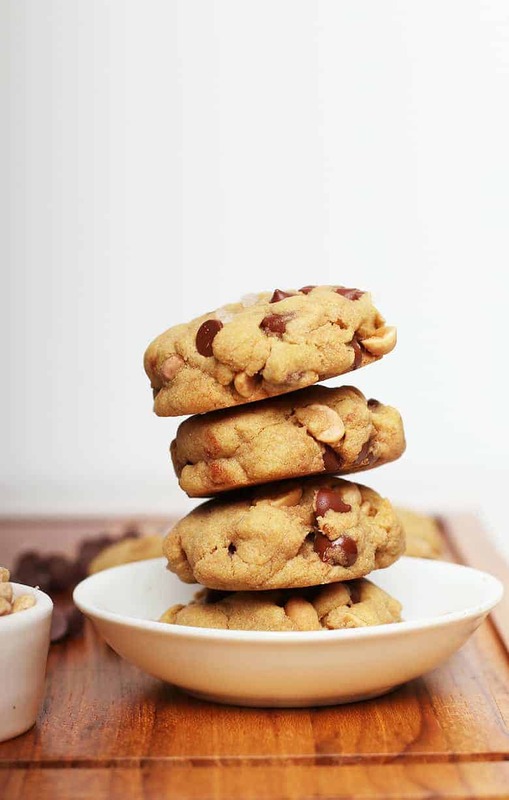 These Gluten-Free Chocolate Chip Cookies are made with quinoa flour for a wonderful gluten-free twist on an American classic cookie. Sprinkle with coarse sea salt for a delightfully sweet and salty treat. In a mixing bowl combine the quinoa flour, baking soda, baking powder, and salt. In a separate bowl, whisk together the coconut oil, sugar, and flax or chickpea flour egg. Add the peanut butter and vanilla extract and stir to combine. Scoop cookies onto the baking sheet (about 2 tablespoons per cookie), flatten slightly and sprinkle a little sea salt on each cookie. Bake for 8 minutes until slightly brown on the edges. They will feel slightly underdone but will continue to harden while they cool. To make a flax egg combine 1 tablespoon of ground flax seeds with 3 tablespoons of water. Whisk together until thick and gelatinous. It's very important that the quinoa flour is superfine, for this reason, I recommend using store-bought rather than grinding your own.